Every family has a few annual traditions: for me and my oldest daughter, it’s attending Womad. Each March, we haul out the camping equipment, stock up the chilly bin, and jump in the car for the five-hour journey to New Plymouth. Our annual pilgrimage takes us through legendary towns like Pātea, where Dalvanius Prime created ‘Poi E’; Hawera, former home of Ronald Hugh Morrieson and current Mecca for the region’s best pies; and Inglewood, where the Fun-Ho toy factory still stands. Each year the Taranaki road works gods have chosen a new place to dig a hole, creating traffic jams on remote stretches of country roads. One year it was so bad I nearly missed my interview slot with Kimbra: I had to get my daughter to take over while I parked. That was all the catalyst she needed. Now she can be seen in the pit with all the other working photographers. She loves it. For us, Womad is a family affair, and it seems to be for everyone who attends. Since it arrived in New Zealand, the Womad festival has featured a dazzling line-up of overseas acts, many of which we would otherwise never see. From the first time it was held in New Zealand – in Auckland in 1997 – its line-ups have also included a large and varied selection of contemporary and returning local acts. 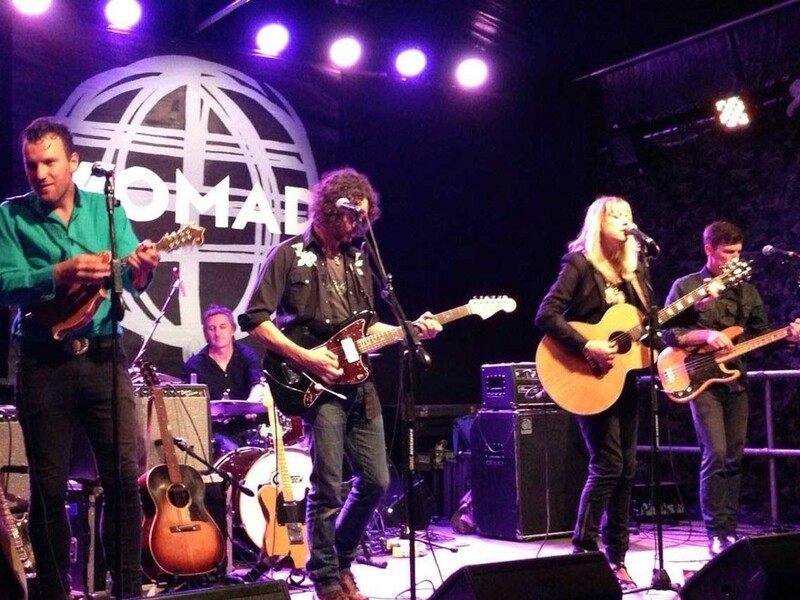 Womad’s artistic directors have featured these local bands not just to boost the numbers. They have wanted to expose their audiences to up and coming acts such as Kimbra, Amiria Grenell, Iva Lamkum, Estère, Flip Grater and LA Mitchell, as well as to give established artists a sympathetic setting, among them Bic Runga, Shona Laing, David Kilgour, Sam Hunt and Neil Finn. 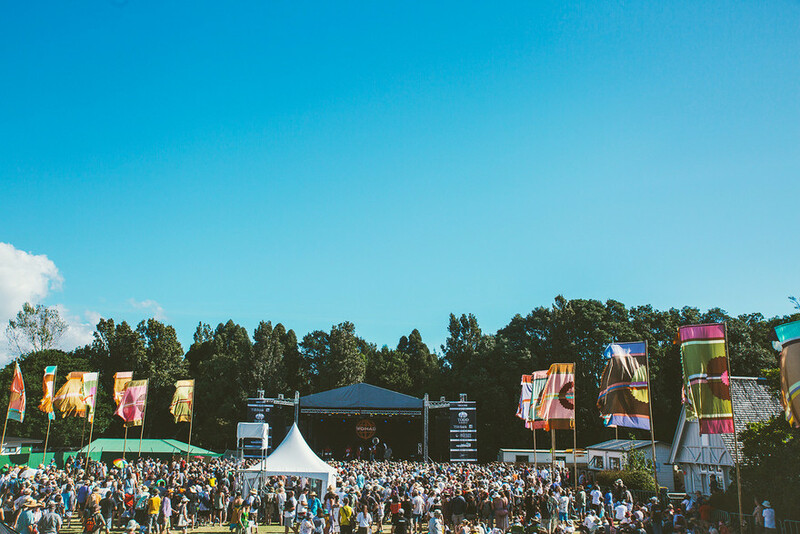 After two festivals in Auckland, Womad shifted to New Plymouth where, in 2018, it will be held for the 14th time at the picturesque Bowl of Brooklands. The festival has presented more than 1000 artists since it moved to Taranaki, many being New Zealanders. As well as the known and aspiring names, there has been a wildcard option. This is where fans got to vote online for their favourite artists, with the winner earning a slot on stage. Often these are bands brought together just for the festival: batucada and gypsy groups are the most popular. Every so often, Womad audiences get a real treat. In 2016 they met Louis Baker for the first time. He was part of Warren Maxwell’s Pass the Gat project, a showcase of its own. At that point, he was barely known outside Wellington but his sweet vocals and soulful ballads won over the crowd. That same year, Thomas Oliver (who also was in the Pass the Gat project) was discovered: mainly by very enthusiastic young female fans. He, too, had honey-like vocals. Although Oliver had been on the capital’s music scene for a while, Womad was a big break. This is the joy and magic of the festival: the discovery of artists, and some that might be right under your nose. But sometimes, sadder moments have created great performances. French for Rabbits put on a stunning and intense show on one of the smaller stages. Their music, mainly from their album The Weight of Melted Snow, was pure and honest, but sometimes crushing in intensity. Little did we know that lead vocalist Brook Singer and her bandmate and partner, John Fitzgerald, were going through a break up. And we can’t forget the stunning show delivered in 2008 by the singer-songwriter Mahinārangi Tocker, which touched the hearts of all present. Sadly, within months, she passed away. 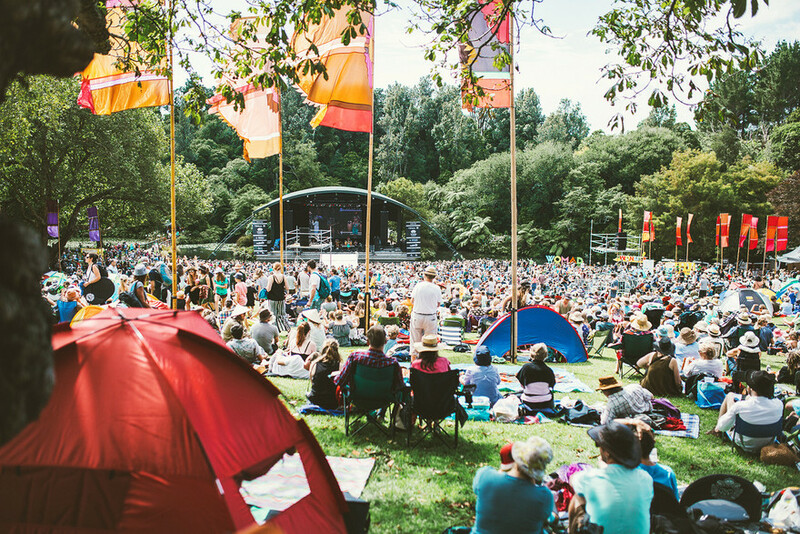 Womad – the World of Music and Dance – began in Britain in 1982, with former Genesis singer Peter Gabriel as one of co-founders. Since then, the organisation has held more than 160 festivals in 27 countries. 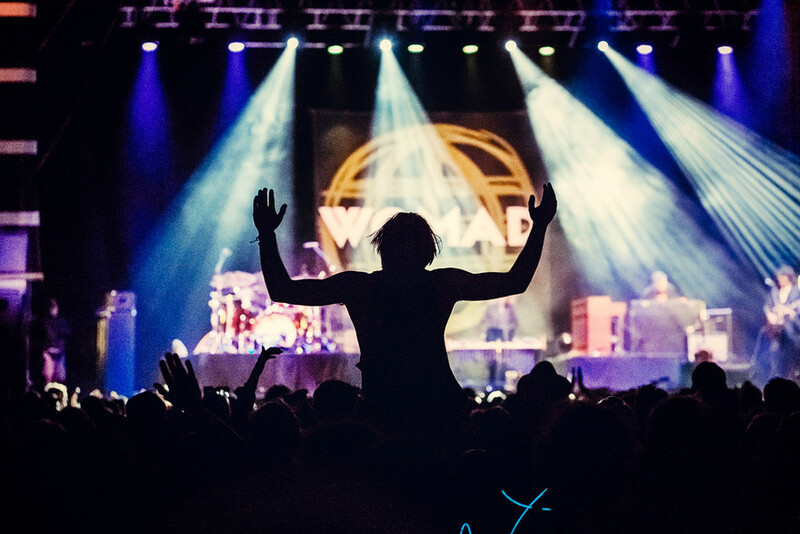 The New Zealand festival was initially a biennial collaboration between Womad’s UK head office, Womadelaide and the New Zealand operators. After two festivals in Auckland, the 2001 event languished due to a lack of sponsorship, and New Plymouth secured the rights. That first Taranaki show in 2003 featured a diverse bill that included several locals, among them Che Fu and The Krates, Don McGlashan, Fat Freddy’s Drop, Moana & The Tribe, Te Vaka, TrinityRoots, Wai and Waihirere. The event became annual in 2007, and 10 years on it attracts between 11,500 and 16,500 visitors a day. The Bowl of Brooklands is a natural amphitheatre, perfect for the bigger acts like Fat Freddy’s Drop, Sola Rosa or Katchafire. 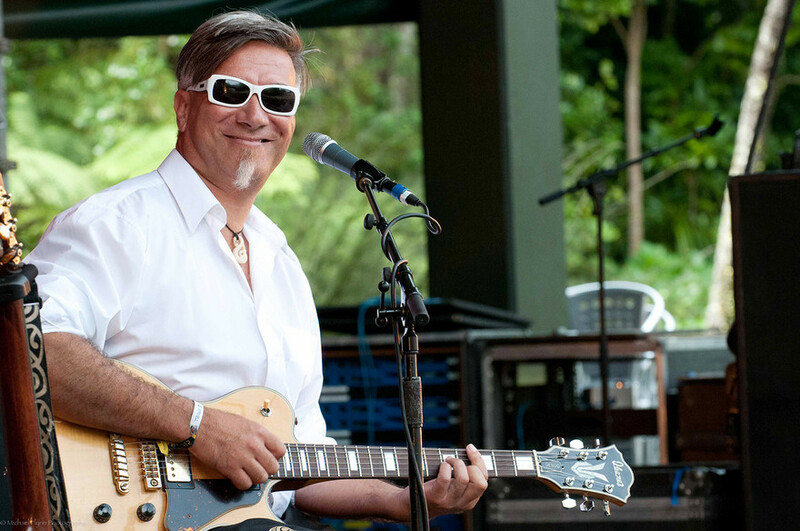 But there are smaller stages such as the tiny Dell which is no bigger than a small club and suits more intimate acts such as jazz artist Carolina Moon, and the delicate voice of Flip Grater. Until Womad came along, Taranaki was principally a farming region, with the addition of offshore oil and gas drilling. It was not known widely as an arts destination, even locally. Among the more conservative quarters of the community, there was even some resistance to ratepayers supporting the development of arts and music; the new Len Lye Centre, which is part of the Govett-Brewster Art Gallery, did not arrive without the requisite stoush. Now everyone realises that, along with Womad, the arts programme in the region is a big attraction for tourists and visitors. There have only been three directors over its 12-year life: Drew James, Roger King, and the current director Emere Wano. All three supported the idea of free entry for children under 12 as a way of encouraging families – and they return year after year. Womad has a huge volunteer army helping out with everything from recycling to courtesy vehicles. Collaboration is also popular on the stage, too: often, New Zealand acts appear multiple times in one year, individually or as part of a bigger troupe. 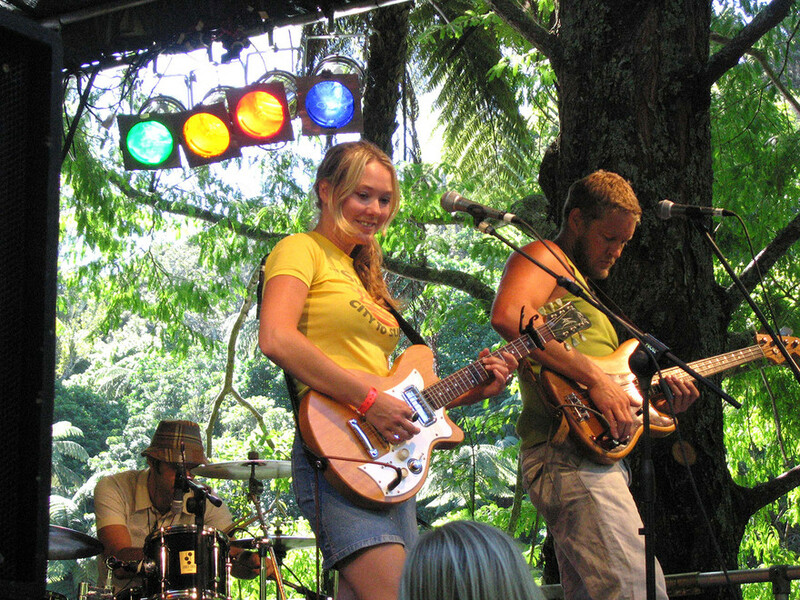 In 2010, Auckland singer Anna Coddington had her own slot on a smaller stage, then popped up again with Barnaby Weir’s Fly My Pretties crew on the Brooklands stage. 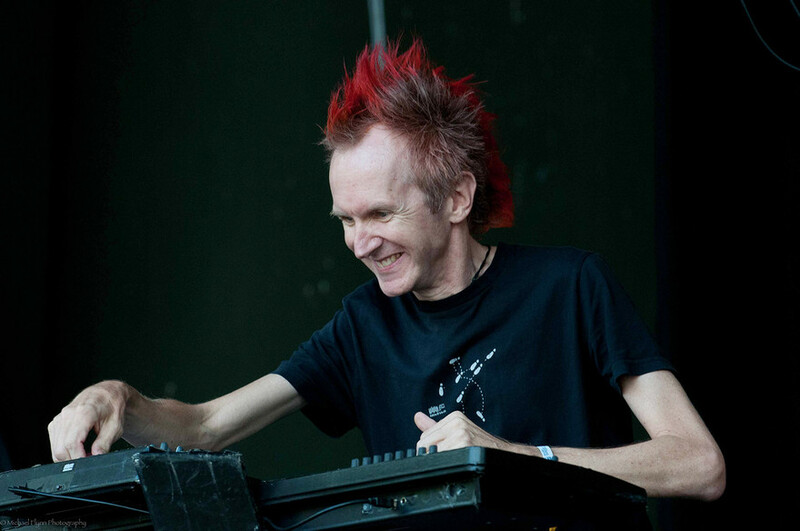 Weir has also performed at several festivals, under his own name or as a member of The Black Seeds. One year he was so busy, when I ran into him backstage I was embarrassed to ask what gig he was doing. Roger King remembers the collaborations he set up during his stint as director from 2003-2009 (no, he is not the same Roger King who managed Dave Dobbyn in the 1980s). His intention was to get overseas artists intermingling on stage. Some were formal collaborations such as the New Zealand String Quartet playing with master percussionist Jojo Hirota or the New Zealand Trio jamming with two Finnish musicians. King is also is proud of organising a jazz session between legendary US drummer Billy Cobham and Wellington-born Jonathan Crayford. But the most amazing session, he thinks, was a show combining a Balinese puppet troupe with Jack Body’s Gamelan Orchestra. Most of New Zealand’s biggest names have appeared: The Topp Twins, Neil Finn (solo and with The Pajama Club), Annie Crummer with her father Will. Many who witnessed Christchurch’s Sami Sisters are still talking about their dulcet tones and unexpected humour. 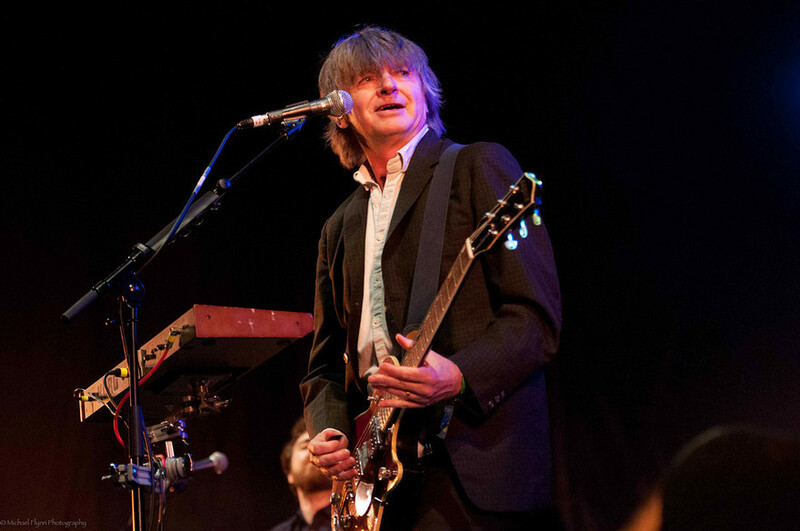 Neil Finn’s 2008 solo gig was a rescue mission when headliner Cesaria Evora had to pull out due to a heart attack. At the 11th hour, King asked Don McGlashan, who was touring with Finn at the time, if he would come on the bill, and was awestruck by Finn’s professionalism. For many artists, performing on the Bowl stage was often challenging: its lake separating performers from the audience. But Finn was nonchalant. 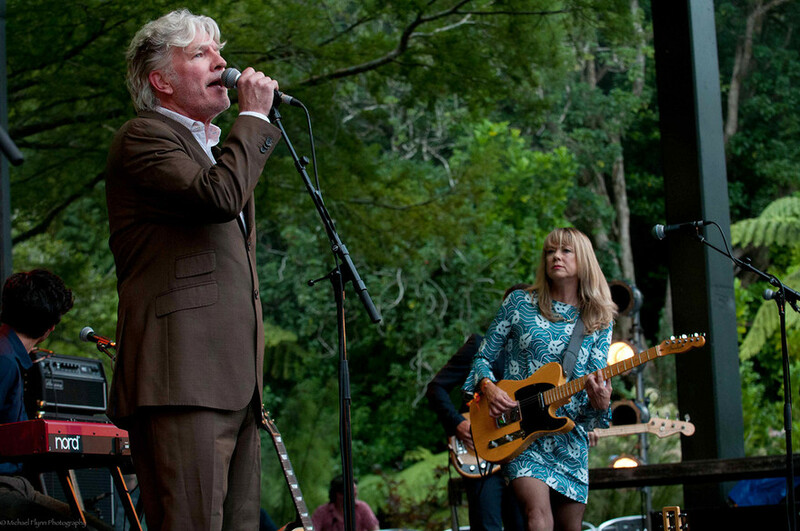 Tim Finn opened Womad in 2014 with an ode to Parihaka, accompanied by children of the current Parihaka settlement, and a band that included Dianne Swann and Brett Adams from The Bads. Later reports described his slot as mesmerising, and even younger audience members were moved by his renditions of classic Enz songs. The Bads at Womad, 2014. L to R: Dave Khan, Wayne Bell, Brett Adams, Dianne Swann, Mike Hall. 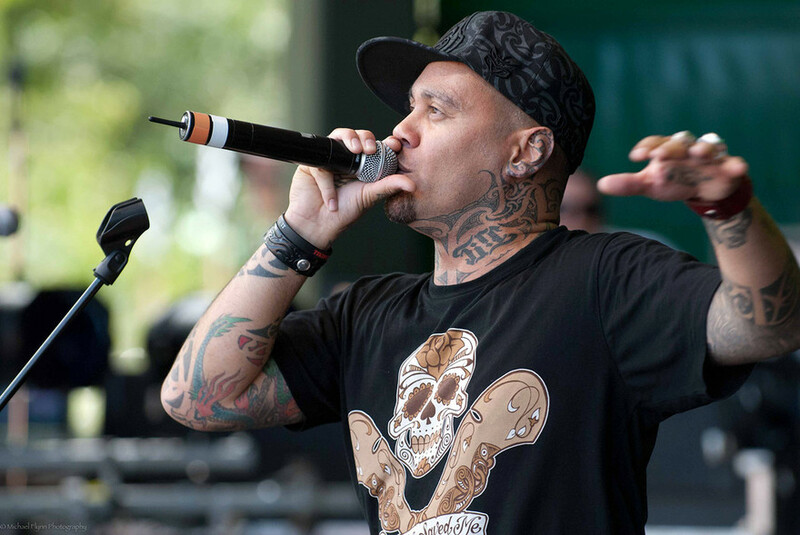 A highlight for overseas musicians is the pōwhiri that starts each Womad, and many overseas performers have mentioned it as a moving, unique experience. From the first festivals, Māori music has been well represented: the 2011 appearance by the original Pātea Māori Club was unforgettable. Along with contemporary incarnations such as Tiki Taane, Moana and the Tribe, and (in 2015) a reunited Trinity Roots, there have been kapa haka groups including Te Kapa Haka o Te Whānau-ā-Apanui, the cultural group Te Waka Huia, and Ngā Purapura o Te Tai Hauāuru. There were also some quirkier takes on Kiwiana, such as The Yoots, a project put together by Fat Freddy’s Drop trombonist Joe Lindsay. The Yoots play classic waiata/show tunes such as ‘Nga Iwi E’ and ‘Tutira Mai’ with a ska flavour; teamed up with the Aotearoa National Māori Choir, their spine-tingling singalong performance brought the house down. Jo Frost, the well-travelled editor of UK world music magazine Songlines, told me this was an exceptional musical experience. 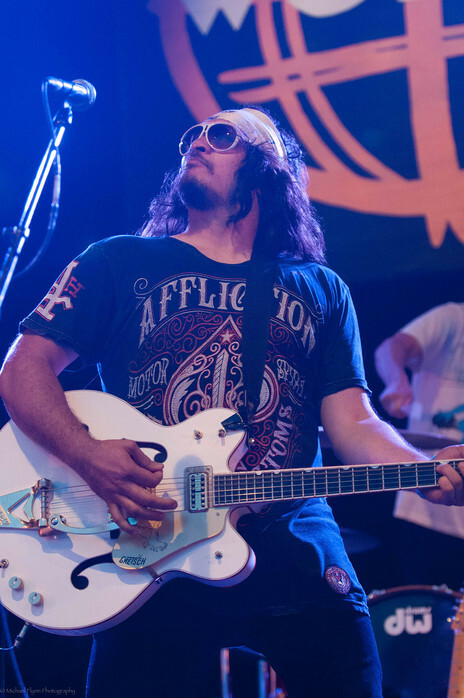 Reggae acts have also been prominent, among them stalwarts such as Katchafire, House of Shem, Sons of Zion and The Black Seeds, as well as newer acts: occasional festival band Newtown Rocksteady, Mike Fabulous’s Lord Echo dub project, or popular Wellington crew Rhombus. There were also some very special performances from country artists. In 2015 southern troubadour Mel Parsons left an indelible mark with her own brand of dusty road Americana. 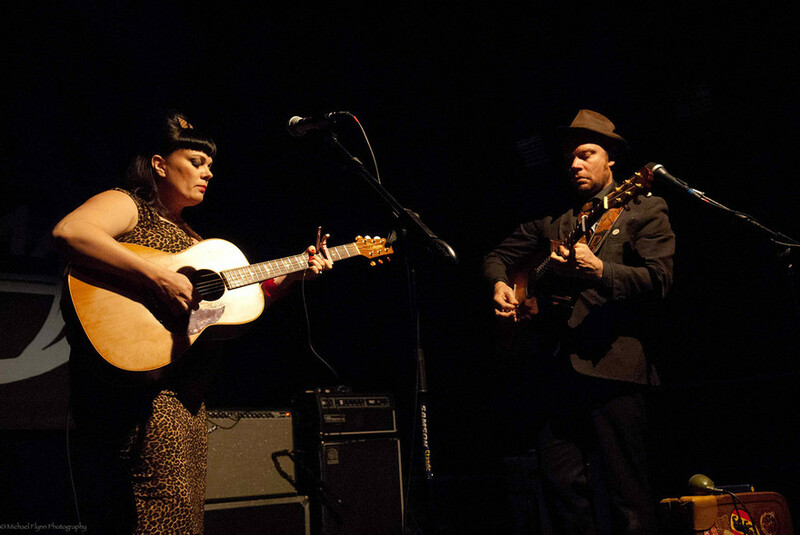 The following year, Tami Neilson was described by RNZ’s Nick Bollinger as “a red-hot honky-tonker, somewhere between Patsy Cline and Wanda Jackson with perhaps just a little bit of Peggy Lee sophistication.” Reports from the front of the stage agreed, and the merchandising tent sold out in five minutes flat. Also impressive in 2015 was ascendant dark-lands crooner Marlon Williams; two years later he returned and won more fans, road-testing songs for his album Make Way For Love. Experimental performances often take place, such as a remarkable collaboration in 2012 between Minuit and Gamelan Taniwha Jaya, who mashed the traditional Indonesian instrument with electronic dance (EDM). Composer John Psathas presented an exceptionally moving excerpt from his World War I extravaganza No Man’s Land, which included live musical performances mixed with recordings and videos made on the battlefields of Europe. And then there were the more “quirky” one-off acts, such as The Nukes, a ukulele “rock” group who blew away the Brooklands stage in 2012. For three guys, they made a heck of a racket, and everybody wanted a bass uke like David “Fingers of Fire” Parker (formerly of Rhythm Cage and The Parker Project). The music stall in the Global Village did a roaring trade on ukes with 3mm bass strings. Womad has also introduced an array of promising acts including, in 2015, Estère: a one-woman beatbox singer and producer from Wellington who is now a regular fixture on the city’s music scene. (My daughter, then 13, interviewed her for a local radio station and was given tips on how to make and mix your own samples using everyday objects by rattling and banging cutlery drawers, biros and box tops.) Also, the very original Mihirangi wowed everybody with her own style of beatboxing. In 2017 DJ/Producer BAYNK scored a spot after a surprise inclusion at the Laneway Festival the previous year (his stage debut). He created all his music and videos on bus rides around Europe, during his OE. At Womad he won over the youth contingent on the Gables stage late on a balmy Saturday night. He was then rebooked for Laneway and a string of festival dates around the globe. Iva Lamkum, from Wellington, was another success story, in 2010. Lamkum’s smoky blues vocals reminded audiences of Billie Holiday, but her funky, contemporary take on soul and hip hop ensured that after the show she had a long line waiting at the album-signing table. 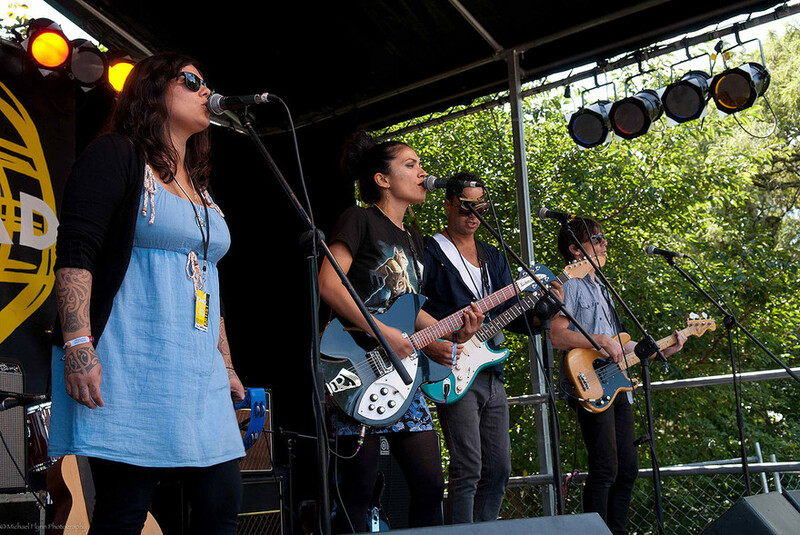 In 2014 Hollie Smith returned to Womad, reintroducing herself to New Zealand audiences after some time away from the big stage. She had been working with Mara TK on a more experimental album, and with Anika Moa and Boh Runga on vineyard and church tours. Smith’s set was particularly memorable because it covered so much diversity of material from the early soul songs on Long Player to the digital work on Band of Brothers #1. Pretty much the entire festival turned up to watch her that night. These are just a few memories from an endless selection that keeps people like me coming back year after year. For my daughter, it was seeing Kimbra on stage after interviewing her; getting MPC lessons from Estère; seeing Julia Deans (2016) in full flight. 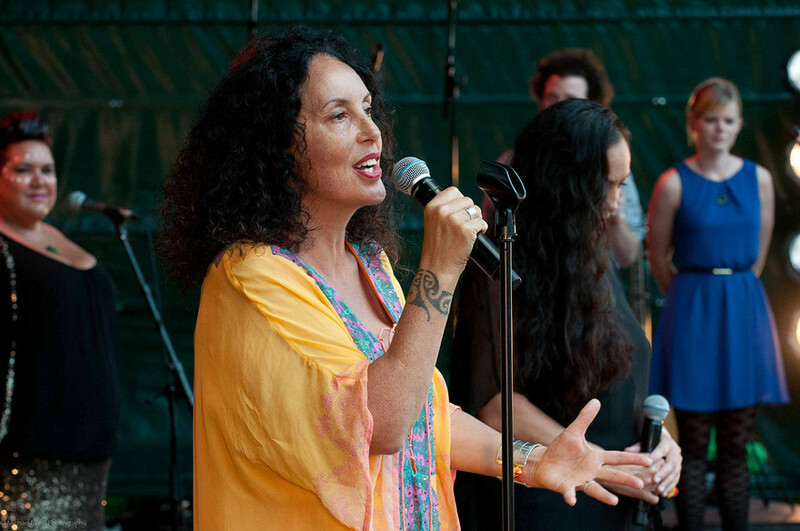 For longtime Womad executive director Suzanne Porter it is the variation over the years: BAYNK, Kora, Ladi 6, Iva Lamkum, Thomas Oliver, Louis Baker, and Katchafire. For Roger King it was the galas: collaborative opportunism created on stage between visiting players and locals. 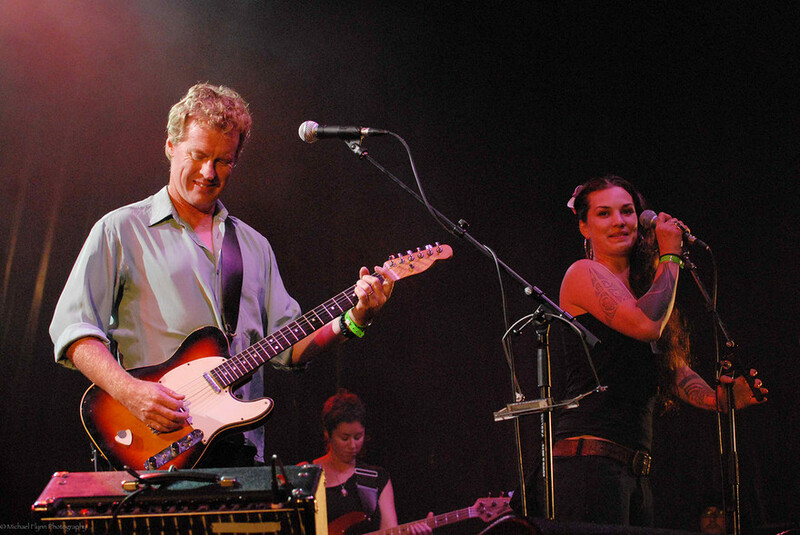 His favourite was 2006, the year organiser Don McGlashan impressed with his ability to get so many different artists on stage in an amazing jam. A family of music. Womad New Zealand 2018 takes place at the TSB Bowl of Brooklands, New Plymouth, from March 16-18.